A private investigator witnesses increasingly bizarre scenes while spying on a young woman. Observance builds up some decent dread and unpleasant images but mostly mistakes atmosphere for narrative and wanders off into pretentiousness before the end. Aussie director Joseph Sims-Dennett’s second feature proves that all the atmosphere in the world doesn’t make up for an undercooked story. Observance is the tale of a man (Lindsay Farris) who is hired to surveil a woman (Stephanie King), because the plot says so. He watches, takes pictures, records phone calls and otherwise bumbles around a seriously crappy apartment. That’s your lot when it comes to the story, with the rest of the time spent on instilling as much creeping dread as possible in the audience. Which kind of works, thanks to engaging sound design and sickly slick visuals alongside half glimpsed terrors, dream sequences and some micro-budgeted body horror. If you’re not fond of retching, this is one to avoid. After an hour or so it becomes clear that Sims-Dennett doesn’t really have anything else to present. We’re going to have long shots of nothing much happening, creepy noises and sometimes our leading man is going to fall over - he’s quite easily shocked for a horror hero. There’s some attempt to liven up proceedings towards the end but then things take a turn for the dullsome with visions and violence and very little explanation. There’s some sense of style here, and more than a touch of filmmaking talent, but the storytelling is all spread too thin, more befitting a short feature. Still, it’s impressive to hear that the director shot this in just 11 days at a cost of $11,000 in Sydney, Australia in the baking summer of 2013. Slightly slipshod American accents prevail, which is a savvy hint at a more lucrative target audience. 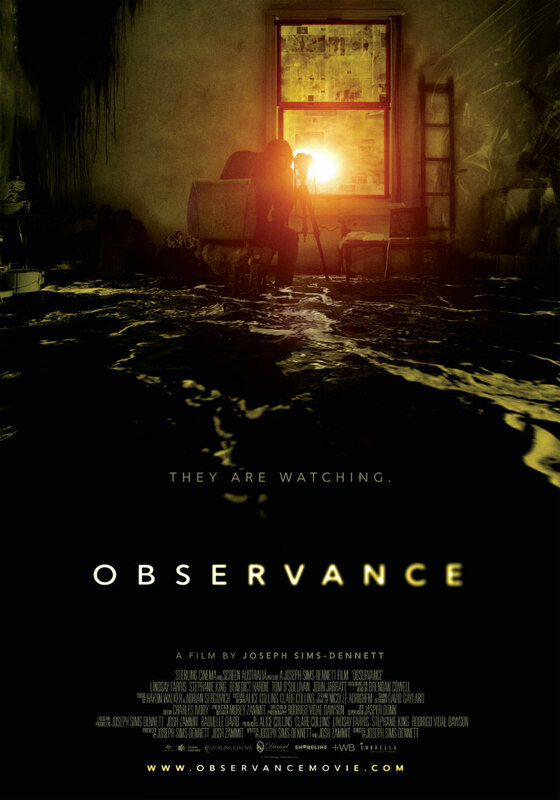 Observance has been receiving decent notices at festivals around the world but didn’t get a theatrical release, meandering onto home media in late 2016. It feels like a calling card for Sims-Dennett, a shout out to the wider industry which he self-funded with a maxed out credit card. And it seems to have worked, with international interest calling on the young Aussie. As for the film itself; it works for its intended purpose of getting noticed and builds up some decent dread and unpleasant images but mostly mistakes atmosphere for narrative and wanders off into pretentiousness before the end. 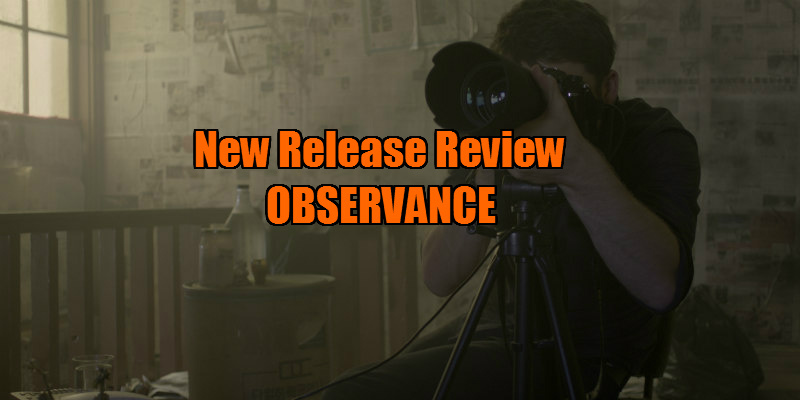 Observance is on DVD and blu-ray August 1st from Artsploitation Films.